Download the Ableton Operator "Where Are Ü Now" Bass rack! Hey guys, Ableton Certified Trainer Ian Gallagher, aka DJ IBG, here. Whether you’re shooting for deep house glory, or just curious about how such a popular sound is created, this is a must watch tutorial. As usual the rack built in this tutorial is free, simply enter your email address above and grab it! First start by grabbing an instance of Ableton’s Operator. Because we’re using FM synthesis to get this sound, we will be choosing the algorithm where Oscillator’s B, C and D are directly affecting Oscillator A (Note: In FM synths like this, Oscillators can also referred to as Operators. For clarity in this post, when I say “Operator”, I mean the synth). To get that character deep house bass we need to dial the envelope of Oscillator B to have no sustain, and give it a really quick decay. This creates a nice quick plucking bass sound. Then just follow this same mapping process for Oscillator C and D’s Coarse and Decay settings. Now as you play with these Macros you realize there are limitless possibilities for creating new bass sounds, just by simply experimenting. You might also want to adjust the volume of the Oscillators to dial in the sound to your taste. There you go! That’s my basic approach to making a Deep House Bass. Make sure to download this rack and happy music making! 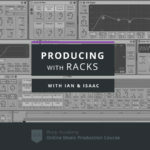 If you liked this tutorial and want to understand, use and exploit every piece that makes up a Rack in Ableton Live, definitely check out my course Producing with Racks. Producing with Racks gives you a diverse and flexible set of tools to work with essential audio effects, plug-ins and instruments. I have a whole playlist of free videos on the course page, so head here to watch them!